ICESTARS intends to make a big leap in the simulation and verification methods for next-generation SHF and EHF band RF front-ends. On the one hand, this pertains to circuits operating at frequencies for which EM methods are necessary to guarantee sufficiently accurate results. On the other hand, this also applies to RF systems with a lot of digital content, either directly in the signal path or to control the RF parts of the transceiver chains. RF design flow, highlighted are the areas, to which the ICESTARS work packages contribute. To achieve the project's objective and be able to deal with specific challenges the project addresses many different topics, such as envelope analysis, distortion localisation, RF circuit dimensioning, improved oscillator analysis and coupled circuit-EM simulation. The ICESTARS research comprises the development of novel methods for time domain simulations, new techniques for frequency domain analysis, electromagnetic simulations and coupling to circuit simulation plus the validation of the achievements in industrial use-cases. Mathematical equations such as ordinary differential equations (ODEs), differential algebraic equations (DAEs) and partial differential equations (PDEs) are core to simulate and predict the behaviour of integrated circuits in chip design. At present, semiconductor devices in an electrical circuit are modeled via equivalent circuits containing only basic elements that can be described by algebraic and ordinary differential equations. With the rapid development of chip technology these equivalent circuits have become more and more complex. 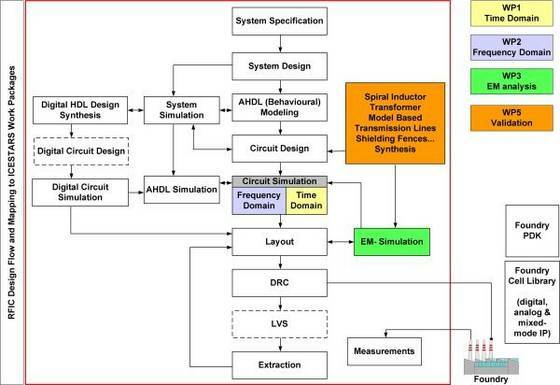 This has motivated the idea of using distributed device models, represented by a system of PDEs, to describe the behavior of the semiconductor devices in the circuit. The resulting mathematical model couples the DAEs describing the circuit and the PDEs modeling the semiconductor devices.